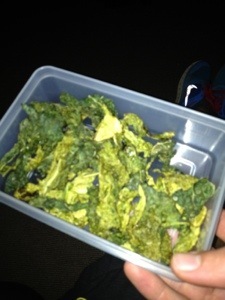 I really fancied trying to make some Kale crisps after seeing a recipe online about it, but when I went to buy some, none of the supermarkets have any due to the current weather. Once I have a craving, I have to have it! So I grabbed a Savoy Cabbage to give it a go with thinking cabbage is cabbage… And it worked! You could try other greens/ cabbages/ lettuce if you wanted a guess. Especially any left overs you have if you’re going to throw them away. A devilishly tasty and super healthy snack providing all the healthy properties of the greens including vitamins, minerals and fibre without the naughtiness or crisps! The hotter you make them, the better they’ll be for you too, getting your metabolism firing. 7. Place on the oven for about an hour and 20 or until crispy. 8. Enjoy and try to resist devouring all instantly! Next Post Easy Homemade ice cream – protein variant too!